Focus: "To adjust one's vision so as to render a clear distinct image." We live in a world where multi tasking is a virtue, and to be politically correct is to be a diverse person. Sure we are getting lots done, but at what cost? Spreading yourself thin is a cause for dry toast. Blech. What ever happened to the single-minded person? Why do we seem to see fewer inventions in this day and age? Have people lost the desire and skill to be dedicated to one task? The desire and skill that makes an Edison or a Banting and Best. I am not talking about self -absorbed individuals. They have a disease I call the MEasles. Self absorbed individuals want focus- everything has to revolve around their needs and desires. How they feel, how they look. They can be intense and busy. They can even be successful. We are surrounded by people and situations like this in our daily lives. Their goals become our goals. I am talking about someone who cares about doing a job and doing it well. Perhaps with little or no attention drawn to themselves. Having a passion and the fire in the belly that makes others either want what they have or want to steer clear of them because change makes us uncomfortable. How many people do you know who have the tenacity (French tenace =single -mindedness) to stick with something long enough to see it to the finish. We live in a world where people are over stressed. We may look on these terms of focus and tenacity and apply them to those we consider as narrow minded or intolerant. Everything in moderation, (watch the cyanide there) and don't sweat the small stuff. Yet this seems to be leading folks to living a life with a shaking foundation and little ability to stick to goals. If indeed a goal was set in the first place. A goal allows you to know where you have been and where you would like to be. It can actually keep your life relatively stress free. All which is dross can fall away. 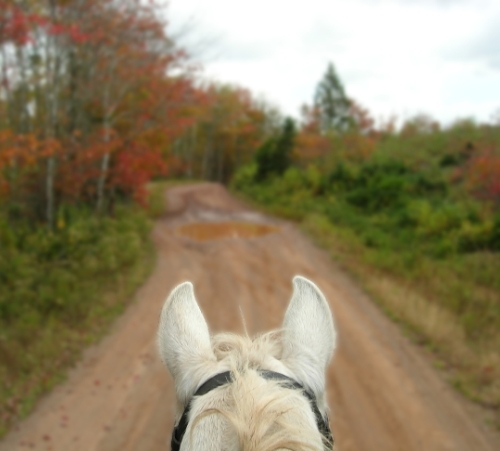 When we ride, we want our horses to be obedient and trained and sometimes, perfect. Yet, do we expect the same from ourselves? We are all in this world of horses for different reasons but it seems the same sort of "help" questions get asked over and over again. There is no shortage of horse magazines (for some, 60 years old) and Internet sites. New people come along all the time and need to be informed. But the days seem to be gone where skills, knowledge and wisdom are practiced and passed on. I see people focusing on their horse's shortcomings, inexperience and "bad" behaviour. They want an end and will get it at any cost. Time is short in our microwave society. Our horses however have not been keeping pace with technology! They live in the same world of no agendas and no guilt. Horses take time. I stick with horses, not for the money (imagine that!) but for the way they can change me and make me a better, different person. They let me make mistakes and give me the desire to reward that forgiving nature by not treating them with disrespect. Let's get a clear distinct image of who we are and what we really want to do with, and for, ourselves and our horses. Narrow mindedness lets me dial a series of numbers and get you - only you on the line. Let's keep our eyes on the prize and push through the finish line.